When you see a champion, there is almost always a role model. For Olympic champions like Florence Griffith Joyner, Jackie Joyner-Kersee and Evelyn Ashford, the role model is Wilma Rudolph, the first American woman to win three gold medals in a single Olympic Games. Crowned the fastest women in the world at the 1960 Rome Olympics, Rudolph easily won the gold in the 100-meter and 200-meter sprints, and anchored the American 4×100 team to victory. Due to her modest grace and her apparent beauty, as well as a life story of overcoming difficult odds to become the best in the world, Rudolph was in the early 1960s the most famous female athlete in the United States, if not the world. And while she is well known for helping to integrate her hometown of Clarksville, Tennessee when she insisted on the relaxation of segregation laws during her Clarksville Welcome Home celebrations, she has perhaps had a more lasting impact on the success of women, particularly black women, in sport. At the banquet in her honor during “Wilma Rudolph Day” on October 4, 1960, she made this statement: “In every effort I have been motivated by one thing: to do justice to those who believe in me and to use my physical talents to the glory of God and the honor of womanhood.” David Maraniss, in his book Rome 1960, pointed out that phrase as a symbol of Rudolph’s true lasting influence. Here was a woman that women, particularly black women, could look up to with pride, and set as the bar for achievement. When Rudolph passed away in November, 1994, here’s what Joyner-Kersee had to say about her idol. She was someone I could always talk to. She was very inspirational. She was always in my corner. If I had a problem, I could pick up the phone and call her at home. It was like talking to your sister or your mother, someone you knew for a lifetime. I always thought of her as being the greatest, and not only athletically. You respected her as a woman. None other than 1960 Olympics teammate and USA team captain, Rafer Johnson, wrote in his autobiography, The Best That I Can Be, that Rudolph’s contribution cannot be overlooked. One of the most important changes has been the advancement of female athletes. In my day, the public suffered under the assumption that women could not compete in the same sports as men, or had to be protected if they did. I remember women’s basketball, for instance, when each team had an offensive and defensive unit so the players did not have to run full court. 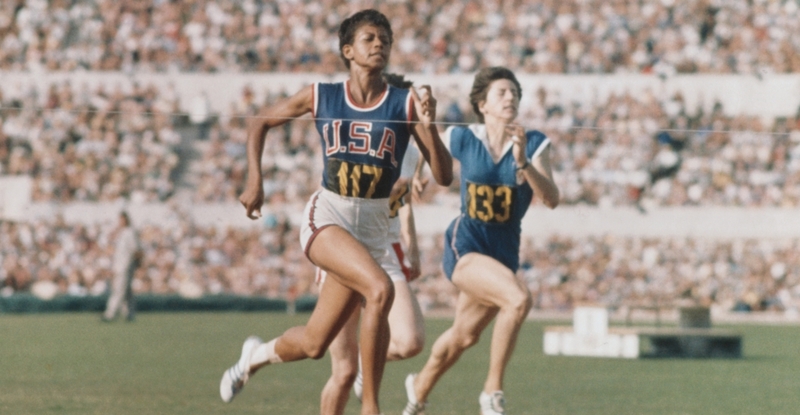 Most of the male athletes I knew had great respect for their female counterparts; we were not surprised to see the strides women have made since Wilma Rudolph dazzled the world in Rome. Posted in Gender, Other Olympics, Pop Culture, Track and FIeld and tagged David Maraniss, Ed Temple, Evelyn Ashford, Florence Griffith Joyner, Jackie Joyner-Kersee, Maureen Smith, Rafer Johnson, Rome 1960, The Best That I Can Be, Wilma Rudolph, Wilma Rudolph Day. Bookmark the permalink.